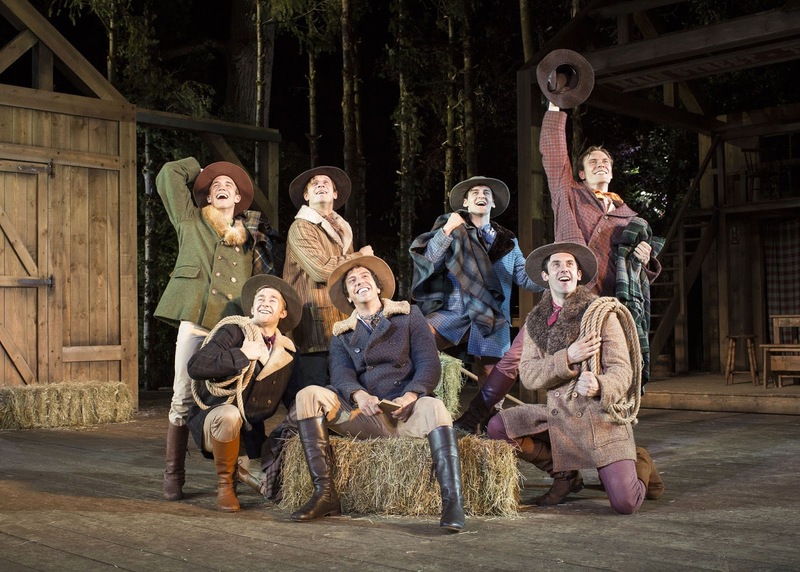 Monday 3rd August 2015: I've seen a fair few reincarnations of this show over the years, most recently the national tour which was doing the rounds in theatres up and down the country. This version however at Regent's Park Open Air theatre knocks the socks off to those seen previously. After the weather took it's toll and the show got cancelled last Friday due to the rain, I got booked in for this evening. 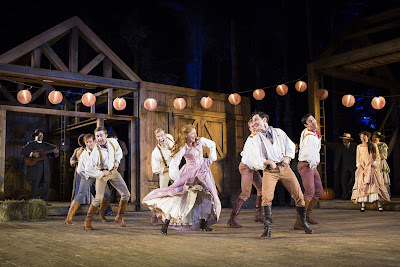 The setting is the main turning point for this production, embedded amongst the trees with the orchestra camouflaged in the back drop, the simple yet wonderful set from Peter McKintosh serves it's purpose, with enough space for the sumptuous dance scenes, choreographed by Alistair David. There's a couple of clever bits going on here, again simple ideas yet done effectively, like the avalanche scene, The Harvest Social and a little dusting of snow for the Winter scenes. If you have seen the old film with Howard Keel in it, you will be familiar with musical numbers and the story line, and this version has a couple of new songs in it which work well, especially We Gotta Make It Through The Winter, sung beautifully by the six brothers. It's hard to single out certain performers, as they all do a stellar job on stage. The orchestrations and arrangements work very well, and vocally all the cast are spot on. As I said earlier though, it is the dancing that stands out, and the numbers are well executed throughout the piece. And after the interval when it is getting darker outside, the ambience of the show is even better as the lighting comes in to play. Overall, a very good show indeed, and worthy of a look on a fine summer's evening.